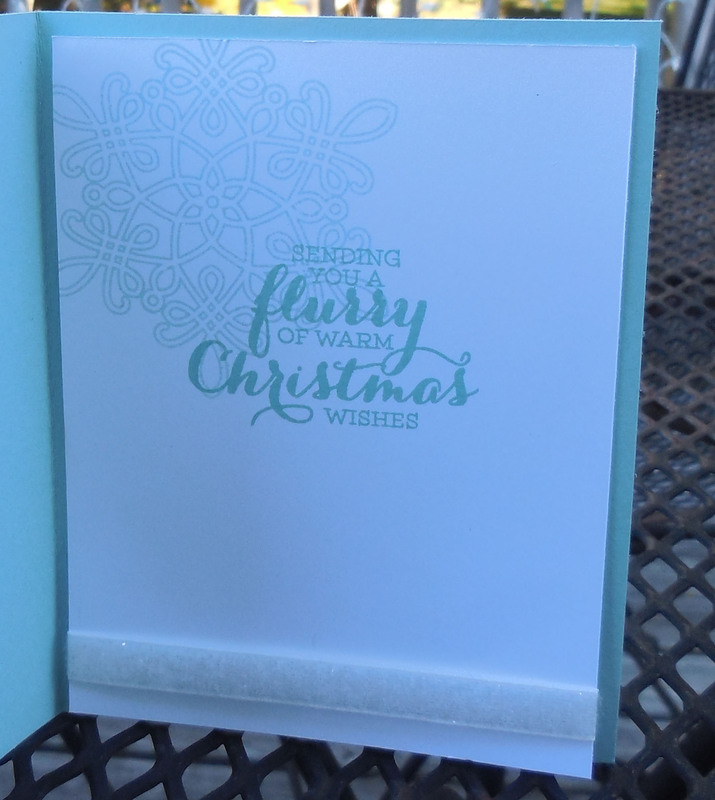 Today I have another Flurry of Wishes Holiday card to share with you from the Stampin’ Up! Holiday catalog. Can you tell that I like snowflakes with blue and silver colors? This is another card that I made using the resist technique with the snowflakes on Whisper White cardstock. I have recorded a video that I will be posting soon for these cards with the resist technique. 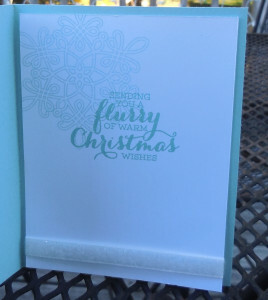 The snowflakes from the Flurry of Wishes stamp set are stamped with white ink on a piece of whisper white card stock that is cut to 5″ x 3 3/4″ and then embossed with Irredescent Ice embossing powder which really gives the card a lot of sparkle! Next I rolled a brayer with Soft Sky ink over the piece several times. I then used the brayer with a layer of pool party ink once. 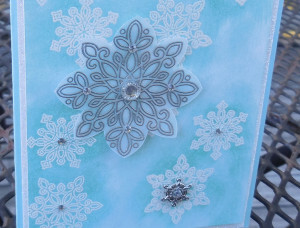 To get the details of the snowflakes to pop – I used a sponge dauber with a l ittle pool party ink over the snowflakes. The card base is an 8 1/2″ x 5 1/2″ piece of Pool Party card stock cut in half and scored at 4 1/4″. I then used a layer of Dazzling Diamonds glitter paper since you can never have too much bling on a card! Can you ever have too many embellishments on a card?I added Rhinestone jewels to the center of the snowflakes and one of the Winter Wonderland Embellishments on the bottom snowflake. 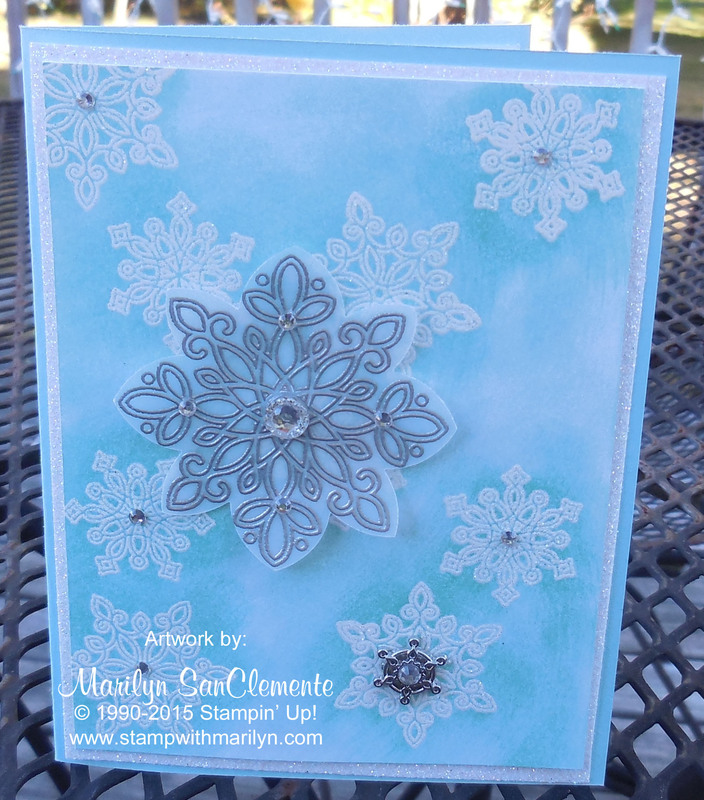 The Silver Snowflake in the center is stamped with Silver ink and embossed with Silver Embossing powder on a piece of card stock vellum. The center of this snowflake is one of the Iced Rhinestone Embellishments. Last but not least I stamped the large snowflake with Soft Sky ink and the sentiment from the Flurry of Wishes stamp set in Pool Party ink. I added a piece of white glitter ribbon to the bottom of the piece of whisper white card stock.